Jesus was a prophet to many, a carpenter to all. He was busy turning water into wine, walking on water, curing the sick, and basically shaping a whole new school of thought. It's no wonder that we're still doing plays and pageants based on him all these thousands of years later. Is your child planning on playing the role of Jesus in a pageant? Or maybe he just wants to spread the teachings this Halloween? 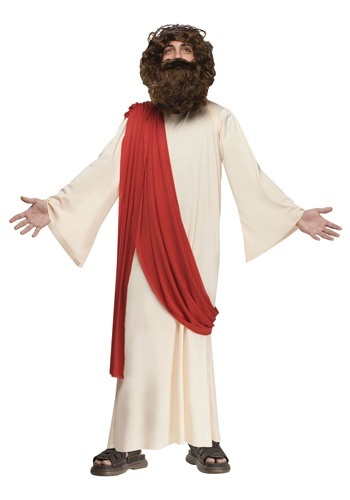 Either way, this Kids Jesus Costume is great for plays, pageants, or any costume party the could use some moral teachings! The wig and beard of this costume will age your little guy considerably, making him look like a full-grown guy, as will the cream robe and rust drape. Just add sandals; the costume includes everything else he will need, including a crown of thorns. It looks like he is all ready for the pageant, but maybe don’t let him test out his own carpentry skills just yet.